Another Advent Sunday, another highlight in our little Christmas Countdown.. and not many words needed: we are extremly happy to be able to give away a copy of Turboweekend's last full length release "Fault Lines" to one lucky winner! Without this band there would be no Good Because Danish blogs. So if you visit the blog regularly, you definitely know Turboweekend. If you don't know them - then it's time to change that! :) This Copenhagen-based band mixes pop and rock sounds with an electronic touch so damn good that it's catchy and heavy at the same time. They released 3 LP's so far and the new one is on it's way. 2012 brought us "Fault Lines" with a more pop atmosphere and more bright songs (compared to the second album "Ghost Of A Chance" with the hit song "Trouble Is"). In 2013 Turboweekend released an EP with acoustic, intimate versions of a few of their songs and played a series of concerts in the same style. We could write a whole book about how much we love these guys and their music. We look very much forward for 2014 and their new stuff! 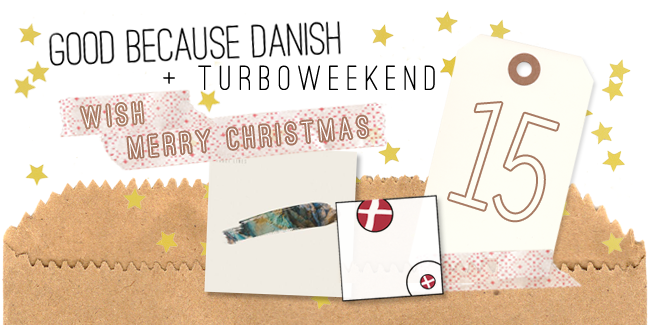 Write a mail with the subject "Christmas Countdown: Turboweekend" to goodbecausedanish@gmail.com and tell us your favorite Danish band/musician/artist (you can include more than one, we understand your trouble of choosing only one...)! Don't forget to also include your address into the mail. Deadline is 25 December 2013. Turboweekend is in the process of recording new material. In the meantime, listen to a song from "Fault Lines" (which can soon be yours!) - the amazing "Neverending".